Disappointed Hawaii Superferry employees prepared to leave Pier 19 yesterday after being told of the 249 layoffs and shutdown of operations. 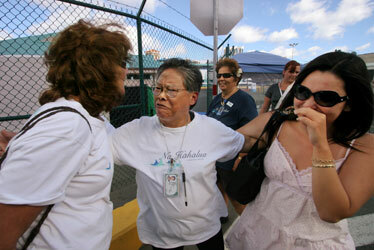 Debra Carlson, left, Felicidad Bartolomie and Kimberly Izumi were emotional as they departed the pier where the vessel is docked. State Senate leaders rejected the first version of a Superferry-salvage bill submitted by the Lingle administration yesterday, even as the company laid off 80 percent of its employees. Company President and Chief Executive Officer John Garibaldi called the furlough of 249 of its 308 staff members "temporary" and remains hopeful that the Legislature will convene a special session and act in the company's favor. Of the employees let go without pay, 178 are Oahu residents, 35 are from Kauai and 36 are from Maui. There were 163 part-time workers in the group, and the company will continue providing health benefits until the end of the month. The company retained 59 workers for administrative duties and maintenance of the vessel. Gov. Linda Lingle has said she will call the Legislature into special session to write a new law allowing the ship to operate, but only if lawmakers decide in advance to save the ferry service. Senate Democrats frowned at the first draft written by Attorney General Mark Bennett, which calls for a statute that "unambiguously allows the Hawaii Superferry project to operate." Senate President Colleen Hanabusa said Democrats want a bill that would address some of the criticisms about the ship possibly hitting whales and bringing in invasive species. Hawaii Superferry staffers were told yesterday that operations would shut down indefinitely and that some 80 percent of the work force, or 249 employees, would be laid off. 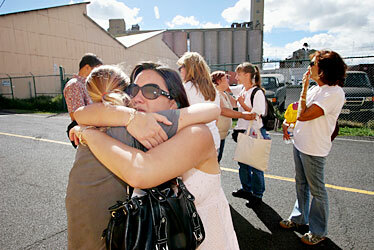 At Pier 19, Heather Smith, top left, and Kimberly Izumi hugged as they left the Superferry dock area. The Hawaii Superferry laid off 249 of its 308 employees yesterday, saying it suffered serious financial blows after seven weeks of unsuccessful court proceedings as it awaits a likely legislative special session that could save operations. Company President and Chief Executive Officer John Garibaldi called the layoff of 80 percent of his staff "temporary" and is remaining optimistic that the Legislature will act in the company's favor. In that case the company will hire back the workers. "We made a very difficult decision today," Garibaldi told reporters after the 2 p.m. announcement. "Maintaining our employees for another number of weeks until we have certainty when that decision (by the Legislature) will be made is just too much for us." Of the employees let go without pay, 178 are Oahu residents, 35 are from Kauai and 36 are on Maui. There were 163 part-time workers in the group, and the company will continue providing health benefits until the end of the month. The company retained 59 workers for administrative duties and maintenance of the vessel. Other employees filed out after receiving the news. Garibaldi testified in Maui Circuit Court that the company is losing about $650,000 a week while the ferry sits idle in Honolulu. "Theoretically, I never thought we would have to be here," he said. "I was looking to have our ferry getting ready for service after this week." Garibaldi said he has received many inquiries from companies abroad, including in Europe and Asia, expressing interest in buying the vessel. But he said his main goal is to keep the vessel in Hawaii, which is dependent on the state Legislature changing the law to allow the ferry to operate. "It's a difficult time," said company spokesman Terry O'Halloran. "This group of people bonded in a way that I've never seen in any other company before." Earlier yesterday employees had a baby shower at noon, the fourth since the company's opening earlier this year. Sometime after the furlough announcement, laughter and applause could be heard outside the office. Kelly Kauahi, manager of commercial sales, vowed that she would still go into work today, despite not getting paid. "We still have clients to take care of," she said. Cabin attendant June Aguon was expecting some good news from yesterday's employee meeting at the Superferry terminal at Honolulu Harbor's Pier 19. She was not prepared for the announcement that the company was placing everyone on furlough. "It was a shock," she said. "I basically teared up." Aguon said she got emotional because she knows many of her co-workers are single parents who have no other jobs. "It hurt me more to see my friends and my co-workers getting laid off, or furloughed as they call it," she said. She also knows that many of them, like her, left other full-time jobs to work for the Superferry. Aguon left her job of eight years working with people with disabilities for what she says was a fantastic opportunity to pursue a new career in a new venture. Ann Cosson left her job aboard a research vessel to become a steward on the Superferry because it afforded her the opportunity to go home at night and still work in the maritime industry. "'Cause to go out and work on a ship, usually you have to leave," Cosson said. "And now there's been 80 people laid off, under furlough, on this ship. And if they're going to continue to work on a ship, they have to leave." Cosson said she is proud of working for the Superferry because it is a service for local people. Rudy Kama still has his full-time job with the state Department of Transportation. He worked part time for the Superferry as a vehicle inspector. "We didn't start doing the things we were trained for. People really didn't give us the time to do it," he said. The employees said the company offered all of them the opportunity to sign up to work part time during the period of furlough, which most said they did. They said the company told them it might hire back about 30 percent of them. The state Department of Labor and Industrial Relations has mobilized its Rapid Response Team to help the dislocated employees find another job, including career planning and individual counseling. Though the Superferry said this is a temporary furlough, these workers are still eligible for unemployment that allows them to collect up to 26 weeks of benefits, said DLIR spokesman James Hardway. 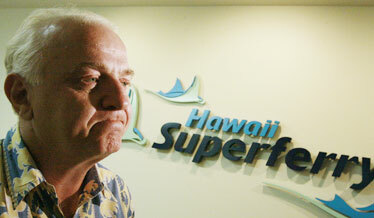 Hawaii Superferry President John Garibaldi was grim yesterday as he announced the layoffs of 249 of the company's 308 employees. State Senate leaders rejected yesterday the first version of a Lingle administration bill to allow the Hawaii Superferry to sail. Senate President Colleen Hanabusa also criticized the operators of the $85 million ship, which has been stalled for almost six weeks by unfavorable court rulings and public protests. "The sentiment of the Senate is everyone is looking at what the bill would look like, and then they will make their final decision as to whether they will support a special session," said Hanabusa (D, Nanakuli-Makua). Gov. Linda Lingle has said she will call the Legislature into a special session to write a new law allowing the ship to operate, but only if lawmakers decide in advance to save the ferry service. Earlier this week the House majority Democrats met and said they were willing to come back to consider a bill to rewrite state law to permit the ship to sail from Oahu to Kauai and Maui. But Democrats in the Senate did not accept the first draft written by Attorney General Mark Bennett. The proposed bill calls for "a statute that unambiguously allows the Hawaii Superferry project to operate" while the state does environmental studies. Hanabusa said Democrats wanted a bill that would address some of the criticisms about the ship hitting whales and bringing in invasive species. Also, the bill should call for a rigorous environmental impact statement to be conducted. Asked about the Superferry decision to furlough 249 of its 308 employees, Hanabusa said the ship's officials have been "extremely insensitive." "Except through their high-priced lobbyists, they have not approached many of the senators or representatives who now hold the key as to whether or not they will ever be able to operate," Hanabusa said. "I don't know who is making these decisions," Hanabusa said, "but it doesn't seem very smart that when they see they are dividing our community -- there comes a point in time when you think someone would step back and say, 'Gee, isn't it time for us to be a good neighbor here? If we want to be part of this community, let's be part of it.'" The angry protests on Kauai have opened up a political problem for Democratic leaders, and Hanabusa said the Superferry has not been helping. "Maybe they feel they can threaten to sue us and that will be enough leverage. We have got people who are hurt, so the people are not going to be happy if the Legislature comes back in." Legislators were swamped yesterday with thousands of e-mails from Superferry supporters, many of whom had gotten a model letter from the Hawaii Superferry Web site. The company was urging people to e-mail the lawmakers, and supporters were filling up the legislators' e-mail boxes. Rep. Kirk Caldwell said form letters were not making much of an impression, but the sheer number of the e-mails made legislators take note. Rep. Josh Green said he had never gotten so many e-mails -- 3,500 -- in one day. He also got more than 100 to his own private e-mail address, which he said was even more impressive. "If people take the time to make a personal effort to ask that the Legislature do some work, we should do some work," Green said. Hanabusa, however, said, "If the Superferry wants to mend fences with everyone, this was not a smart thing to do," adding that e-mails coming from a template are discounted.